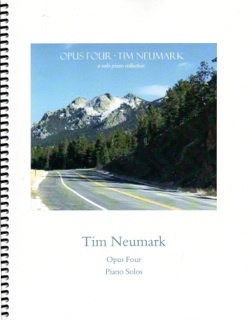 Opus Four: A Solo Piano Collection is the companion sheet music book to Tim Neumark’s 2013 release, Opus Four. 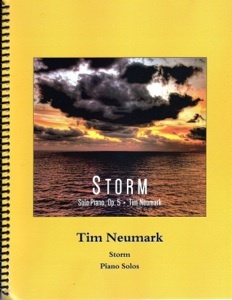 All thirteen pieces from the album were transcribed by John Zechiel and edited by Tim Neumark and myself, ensuring that the sheet music is a note-for-note match to the CD. The music is printed on bright white paper of a medium weight, which will keep the pages looking good through years of use. The layout is roomy and crisp, making the music easy to read. The hard copy book is spiral bound, allowing the book to open flat on the piano. Most of the pieces are relatively easy to play - pianists at an upper-intermediate to early-advanced playing level should have no problem mastering this music. There are no difficult key signatures, and most of the timing is very straight-forward. There are a variety of moods and playing styles in the music, from light and playful to darker and more somber. 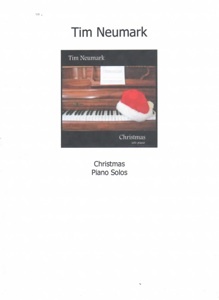 (For a review of the music itself, please see my CD review.) Pedal markings and metronome settings are also included, and there are no reaches of more than an octave. Several of the pieces are spirited and a lot of fun to play, so this book is suitable for pianists of any age with a bit of playing experience. 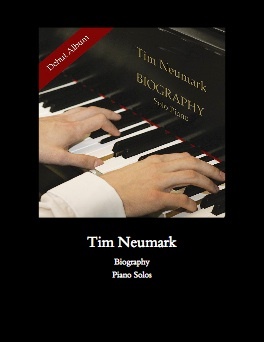 I especially enjoy playing “Persian Rhapsody,” “Waltz in F Minor,” “Winter Dreams,” and “Adagio Sostenuto.” The book is available in both hard copy and download forms from timneumark.com. Recommended!